Our fourth model railway auction of the year was held on one of the hottest days of the year with blazing sunshine making a welcome appearance. Our air conditioned viewing rooms were the place to be, somewhere to cool down and somewhere to indulge in all things model railway. The sale began with the real steam section and this amazing gauge 1 kit built Aster Models 2006 30th Anniversary Model of the Battle of Britain Class ‘Spitfire’ locomotive and tender realised £2,832. In the O gauge section highlights included this Fine Scale Brass ‘King George V’ locomotive and tender which sold for £914. This Bassett-Lowke clockwork ‘Prince Charles’ locomotive and tender realised £165. And this Loveless & Co A4 Class ‘Mallard’ locomotive and tender which achieved £1,298. In the OO gauge section this Bachmann DCC fitted Midland Pullman 6 Car DMU set realised £271. 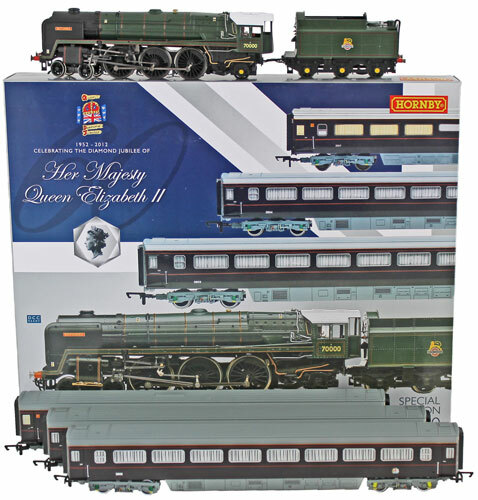 And this Hornby DCC Ready Queen Elizabeth II Diamond Jubilee set sold for £118. There was a good range of Wrenn locomotives offered in this sale with this Streamlined Bullied Pacific ‘Blue Funnel Line’ locomotive and tender achieving £177. And this Streamlined Bullied Pacific ‘Fighter Piolet’ which realised £129. Our next Model Railway auction will be held on Wednesday 21st September 2016. The full catalogue for this sale will be on our website in the next few weeks or keep an eye on our Twitter and Facebook pages which will include updates of our latest auction news.